Not to be confused with St Neot, Cornwall. For other uses, see St Neot (disambiguation). 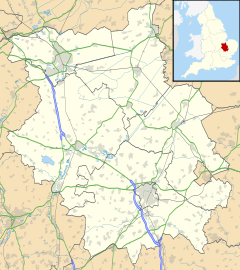 St Neots (/ˈniːəts/ NEE-əts) is a town and civil parish in the non-metropolitan county of Cambridgeshire, England, within the historic county of Huntingdonshire, next to the Bedfordshire county border. It lies on the banks of the River Great Ouse in the Huntingdonshire District, 15 miles (24 km) west of Cambridge and 50 miles (80 km) north of central London. St Neots is the largest town in Cambridgeshire[note 1] with a population of approximately 40,000 in 2014. The town is named after the Cornish monk Saint Neot, whose bones were subject to translation from the hamlet of St Neot on Bodmin Moor on consecration of the Priory of St Neots circa 980. Pilgrimage to St Neots brought prosperity for the town, and it was granted a market charter in 1130. In the 18th and 19th centuries, the town enjoyed further prosperity through corn milling, brewing, stagecoach traffic, and railways. After the Second World War, the town and its industry grew rapidly as London councils paid for new housing to be built in the town to rehouse families from London. The first London overspill housing was completed in the early 1960s. In 2012, archaeological excavations discovered prehistoric Mesolithic, Early Neolithic era, Iron Age, Roman and Early Middle Saxon items at the new town centre cinema development. Some five years earlier, Cambridge University Archaeologists uncovered significant remains of an Iron Age settlement of Round Houses during eastern town excavations. These findings confirm settlements having existed for over 3,000 years. Roman, Saxon and Medieval finds have also been made in and around St Neots. Early Saxon developments were in Eynesbury, Eaton Socon and Eaton Ford, which still exist as part of the town today; and Maltman's Green and Crosshall Ford which are no longer recognised. The Anglo Saxon Chronicles record that in 917 the Danish King of East Anglia left Huntingdon to attack Saxon settlements but was defeated and killed at the Battle of Tempsford near St Neots. The Normans rebuilt the Priory near the river and, in 1113, the Priory of St Neots was given its own manor, separate from Eyenesbury, which it had previously been part of. The town formed was named St Neots, and remained partially entwined with Eynesbury until approximately 1204, when the two parishes were formally separated. A castle was built in the 12th century on the riverbank at Eaton (modern Eaton Socon); the earth-mound remnants still exist today. The parish church was rebuilt in the 15th century, and is one of the few currently extant churches of this period in England. A large part of the original church remains, including stained glass windows depicting the life of Christ. The Great Ouse was made navigable from St Ives to Bedford, via St Neots, in 1629, increasing river-borne trade in the town. The separate village of Eynesbury became re-incorporated into St Neots in 1876. Eaton Ford and Eaton Socon, two villages across the county boundary formed by the River Great Ouse in Bedfordshire, were merged into St Neots in 1965. Technology-based industries are located in some of the town's light industrial estates, and there is a gas turbine power station at Little Barford on the edge of the town. Recent development has added Eynesbury Manor, Love's Farm, and the Island, Little Paxton bringing the population above 40,000. An ambitious new development of 2,800 homes to the East of the town called Wintringham Park is set for completion in Winter 2019. It is projected that the population of the town will be 65,000 by the end of the Huntingdonshire Local Plan period (2036). St Neots is a civil parish, and its lowest tier of governance is its town council, which consists of twenty-one elected councillors including a town mayor and a deputy town mayor. The second tier of local government is Huntingdonshire District Council which is a non-metropolitan district of Cambridgeshire. St Neots is divided into four district wards; St Neots Eaton Ford, St Neots Eaton Socon, St Neots Eynesbury, and St Neots Priory Park, each of which is represented on the district council by two councillors. The highest tier of local government is Cambridgeshire County Council. St Neots is part of two electoral divisions; Little Paxton and St Neots North; and St Neots Eaton Socon and Eynesbury, each of which is represented on the county council by two councillors. At Westminster, St Neots is in the parliamentary constituency of Huntingdon. Since 2001 it has been represented in the House of Commons by Jonathan Djanogly (Conservative). St Neots was in the constituency of Cambridgeshire South West from 1983 until 1997 when it was transferred to Huntingdon. For the European Parliament St Neots is part of the East of England constituency. St Neots is approximately 49 miles north of London. It is close to the south-western boundary of Huntingdonshire District, and both the city of Cambridge and the county town of Bedford are nearby. St Neots lies in the valley of the River Great Ouse, partly on the flood plain and partly on slightly higher ground a little further from the water. The Great Ouse is a mature river, once wide and shallow but now controlled by weirs and sluices and usually constrained in a well-defined channel. Tributaries entering the Great Ouse in the town are the River Kym, Hen Brook, Duloe Brook and Colmworth Brook. The area is generally low-lying. The Riverside Fields, an amenity area adjacent to St Neots Bridge, is designed as a flood buffer area, and is under water at times of flood, protecting dwelling and commercial property from flood. St Neots developed at the site of a ford where overland routes converged. This was replaced by a medieval bridge, and today there are two further crossings just outside the town, one to the north and another to the south. The soil is mainly light, overlying gravel beds, and gravel extraction is one of the local industries. Older disused gravel pits form useful nature reserves and amenity areas at nearby Paxton Pits and at the Wyboston Leisure Park. Away from the river, the higher land is mainly a heavy clay soil with few large settlements. Much of the land is used for arable farming. From 1801–1901, the population of St Neots was recorded every ten years through the UK census. During this time, the population was in the range of 1,752 (the lowest recorded level was in 1801) and 3,321 (the highest was in 1861). From 1901, a census was taken in the UK every ten years with the exception of 1941 due to the Second World War. Except for 2011, all population census figures from report Historic Census figures Cambridgeshire to 2011 by Cambridgeshire Insight. 2011 Census figure. In 2011, the parish covered an area of 3,776 acres (1,528 hectares) and the population density of St Neots in 2011 was 5,232.2 persons per square mile (2,020.3 per square kilometre). St Neots railway station is located on the East Coast Main Line and provides half-hourly trains south to London (London King's Cross) and north to Peterborough. Journey times to London King's Cross typically range from 36 minutes to one hour. The station is managed and served by Great Northern. A new footbridge opened in February 2014, linking the Love's Farm housing development and Rowley Park Stadium to the railway station and the rest of the town, as well as providing lifts to all platforms. St Neots is bypassed by the A1 which links the town by road with London to the south and Peterborough to the north, while the nearby A14 provides access to the Midlands and East Anglia. Until the three-mile £8 million A45 St Neots Bypass opened in December 1985 (subsequently re-designated as the A428), traffic to and from Cambridge had to pass through the town centre. The A421 begins at Black Cat Roundabout on the A1 just south of the town, connecting with Bedford and Milton Keynes, and carrying much of the traffic between Oxford and Cambridge. Regular local buses are provided by Stagecoach in Huntingdonshire and Go Whippet. St Neots is served by the cross country X5 service that runs between Cambridge and Oxford. There is also the Route 66, run by Stagecoach which goes into Huntingdon. The route and location of the St Neots (Southern) Foot and Cycle Bridge. St Neots is on Route 12 of the Sustrans national cycle route that connects Colchester and Oxford via Harwich, Felixstowe, Ipswich, Bury St Edmunds, Cambridge, Huntingdon, Sandy, Bedford and Milton Keynes. A foot and cycle bridge across the River Great Ouse was opened in 2011, connecting the communities of Eaton Socon and Eynesbury. A public consultation on the scheme was held in 2003 with public exhibitions held in December 2008. The new bow string arch bridge has a span of 346 m (1,135 ft) (including access ramps), and includes lighting and improvements to the connecting cycle paths. The scheme was supported by Cambridgeshire County Council, Huntingdonshire District Council and is a Sustrans Connect2 project. The bridge had an estimated construction cost of £3.5 million with Sustrans contributing an additional £700,000. The construction started in January 2011 and was completed on time and within budget during September 2011. The use of a Compulsory Purchase Order for the necessary land was approved. The route of the cycle way has connected Shakespeare Road, in Eaton Socon, to Barford Road, in Eynesbury and follows the southern boundary of St Neots Community School. A public consultation carried out in August 2018 looked at three separate designs for a planned pedestrian/bicycle bridge and asked for residents opinions. A decision was made in November 2018 to progress with the suspension bridge option. Construction is due to start in October 2020 and estimated to take around eight to ten months. St Neots has a semi-professional non-League football team, St Neots Town F.C., who play at Rowley Park Stadium. The club are currently members of the Southern Football League Premier Division. The town also has a rugby club St Neots RUFC, a rowing club St Neots Rowing Club, two Dragon Boat teams and a table tennis club, the St Neots Table Tennis club, which plays in both the Bedford and District Table Tennis League and the Cambridgeshire Table Tennis League. The Rowley Arts Centre was opened in May 2014. The development includes a piazza walkway line with popular national chain restaurants and state-of-the-art cinema complex. The development is named after Peter Rowley, an American playwright, author and critic who was Lord of the Manor of St Neots. He donated £1 million towards the development. The cinema contains six screens capable of accommodating 900 people. The build specification is in accordance with Cineworld deluxe standard and nearly all screens are equipped with the latest 3D projection. The Rowley Auditorium also provides a venue for live performances, with adapted seating area and spotlighting. There are also lifts and box seating for disabled visitors. St Neots Museum, housed in the town's Victorian Police Station and Magistrates Court, has local history collections covering the town's rich past including a display about James Toller, the Eynesbury Giant, a resident from the 18th century who measured over 8 ft in height. There is also a gallery with temporary exhibitions by local creatives including fine art, ceramics, sculpture and illustration. Local notable music venues include the Priory Centre, and has been host to many great entertainers as well as holding productions by local amateur dramatic groups and the Pig and Falcon, which has live music every Wednesday, Friday and Saturday and regular open mic nights. The town has a community radio station which was granted an FM radio licence by Ofcom in 2015. The station has been broadcasting under the name Black Cat 107 regularly since April 2017. There is a thriving theatre community with four active groups – Riverside Theatre Company who stage productions, run workshops and have groups for all ages; VAMPS formed in 1961 as the St Neots and District Operatic Society and stage popular musicals and variety shows; award-winning, St Neots Players, formed in the late 1920s as a play-reading group with past members who used to perform the annual Shakespeare, Pantomime and other mid-season productions at the Kings Head Hotel in the Stables Theatre; and Stageworks, a performing arts group offering classes, holiday programmes, workshops and a college offering full-time training to students aged 16 years and over that prepares students for musical theatre and acting. The local creative community is served by art youth club, Vir2oso, which runs regular workshops and clubs for 8 and 17 year-olds at the Bargoves Centre and aims to encourage and support children who feel despondent and dejected in their school life and those with learning difficulties. There is also Neotists, a group for creative professionals with members covering design, illustration, art, photography and IT, which commissions local creatives to collaborate on projects, run workshops and events for the community and provide opportunities and connections for professionals working in the creative industry. John Bellingham, the only man to assassinate a British Prime Minister (Spencer Perceval on 11 May 1812), lived in St Neots. Footballers John Gregory, Lee Philpott, and Tim Breacker are from the town, as well as Olympic High Jump Bronze medallist Robbie Grabarz and Olympic fencer Graham Paul. Multiple World short course swimming champion Mark Foster also lives in St Neots. Other people from the town include actor Rula Lenska. ^ www.stridedesign.com, Stride Design Ltd, Cambridge, UK, 2006,. "Cambridge Archaeological Unit". www-cau.arch.cam.ac.uk. ^ a b c Page, William; Proby, Granville; Inskipp Ladds, S, eds. (1932). "Parishes: St Neots". A History of the County of Huntingdon. London: Victoria County History. 2: 337–346. Retrieved 26 July 2016. ^ "The story so far". Wintringham St Neots. Retrieved 16 January 2019. ^ "Huntingdonshire District Council: Councillors". www.huntingdonshire.gov.uk. Huntingdonshire District Council. Retrieved 23 February 2016. ^ "St Neots 2000–2012". World Weather Online. Retrieved 26 June 2015. ^ a b c "Historic Census figures Cambridgeshire to 2011". www.cambridgeshireinsight.org.uk. Cambridgeshire Insight. Archived from the original (xlsx – download) on 15 February 2016. Retrieved 12 February 2016. ^ "Neighbourhood Statistics: Lead Key Figures 2011 Census: St Neots (Parish)". www.neighbourhood.statistics.gov.uk. Office for National Statistics. Retrieved 14 February 2016. ^ "St Neots (Southern) Foot and Cycle Bridge". Cambridgeshire County Council. Retrieved 7 July 2009. ^ The bridge is known locally as the Willow Bridge. "St Neots (Southern) Foot and Cycle Bridge Briefing Note" (PDF). Cambridgeshire County Council. 2008. Retrieved 7 July 2009. ^ "Cycling & pedestrian improvements". Cambridgeshire County Council. Retrieved 16 January 2019. ^ "St Neots first market town backed by Combined Authority". cambridgeshirepeterborough-ca.gov.uk. Retrieved 16 January 2019. ^ "Foster covets first Olympic medal". BBC News. 15 July 2008. Retrieved 27 March 2010. ^ "Rula Lenska". bfi.ork.uk. British Film Institute. Retrieved 25 July 2016.